Are you good at iPad word games? As we all know, word games have been around for ages and they still live on and are popular as strong as ever in today’s day and age. iPad word games can stimulate your brain and make words fun, just like kindergarten, for they test your puzzle-solving skills, trivia knowledge, and sheer reflexes. As there’s a ton of great free word games for iPad available, it’s really hard to find ones that truly stick out. 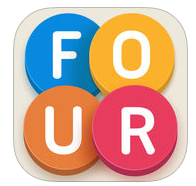 Do not worry, we have rounded up top 5 word games on iPad in the App Store. To find out which are the best free word game apps for iPad that make the cut, read on after the break. How to Transfer your game data on one iPad to Another? If you love clever word games and adorable bears of different shapes and styles, you will love this word game app for iPad, Alphabear. 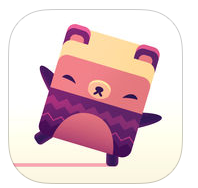 Alphabear is an original word puzzle game by Spry Fox, the developer of the award winning game Triple Town. As one of the best free word games for iPad, Alphabear is a fun blend of wordplay and strategy, along with collectible bears that provide very specific bonuses that can be mixed and matched. Once you download the free word games for iPad, Four Letters, you will find you are in a totally incredible fun world. Four Letters can always challenge you to keep building tiny words, for there are thousands of possible letter combinations. It is pretty addictive! In addition, there is a dictionary where you can view all the words you’ve made and you can compete and compare scores too. Following a sudden earthquake, Seb must escape a crumbling skyscaper. 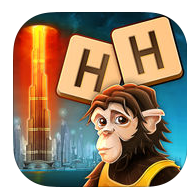 And Highrise Heroes is also a game about saving a group of people on the top floor. As one of the best free word game apps for iPad, you can find out strategy is the key to success! And each new level you face will guide this makeshift crew closer to safety. The story itself is a bit goofy, but as one of the free word games for iPad, it uses the premise to shake up the normal word-building gameplay is definitely ingenious. Typeshift, the iPad word games, has concocted a word-creation game that you just don’t want to put down and it give you the gist of why this is such a uniquely compelling combination, which is the modern anagram puzzle, combining wordplay, modern game design and a mobile-first approach. 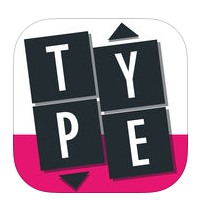 What is more, as one of the excellent word games for iPad, Typeshift features a free daily challenge with global leaderboards. 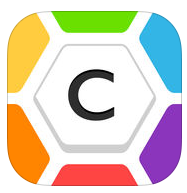 Capitals is one of the free and addictive word games for iPad, for it will bring you enough tactical differences to make this brany word-battle also well worth digging into. With this word games for iPad, you can even personalize the look of your Capital. Time to compete against your Facebook and Game Center friends. This roundup has focused on 5 different word games for iPad that are among my favorites as well as other writers’ favorites here. Have you got the word games for iPad that you like best? If not, share the one you like with us anytime. After using your iPad for a certain time, you might consider updating to a newer model. One problem we have to deal with is getting the data on the old iPad to the new one, especially those game data. You might not want to lose the game data of the word game you’ve been playing of a long time. To transfer the game data from one iPad to another, you can use iTunes or iCloud. But when you use iTunes to restore your new iPad from the backup of an old iPad, there might be compatibility problems. So the best choice here would be iCloud. Here’s how to transfer your game data from one iPad to another via iCloud. Part 1: Manually Back up your old iPad to iCloud. On your old iPad, navigate to Settings>[your name]>iCloud>iCloud Backup and tap Back Up Now. 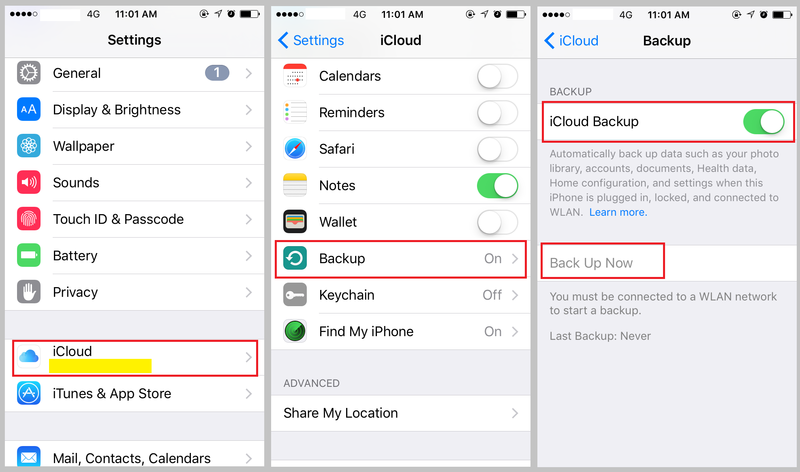 If you are using iOS 10.3 or later, for iPad running iOS10.2 or earlier, go to Settings>iCloud>iCloud Backup and tap Back Up Now. Part 2: Set Up Your New iPad from iCloud. 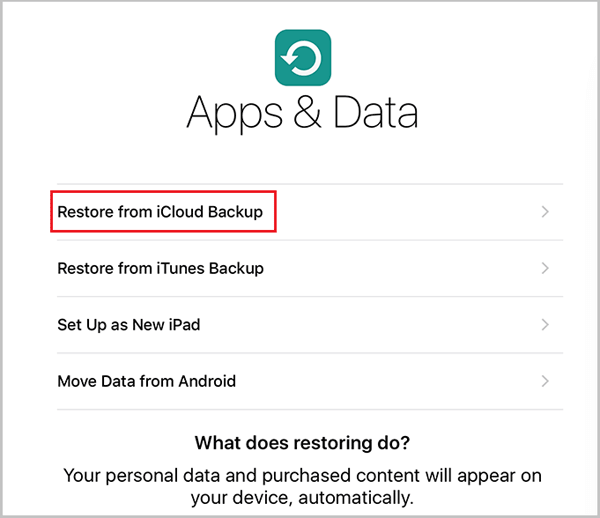 When setting up your iPad for the first time, you can choose to directly restore your iPad from iCloud backup. When you set up your iPad, on the Apps & Data screen, there’s an option for restoring your new iPad from iCloud backup, tap on it and you will be asked to sign into iCloud. After signing in, choose the backup that you want to restore. When using iTunes or iCloud to restore your iPad from an old backup, your old data on the current iPad would most likely be overwritten. There are programs that could help you extract certain files from your iTunes and iCloud backups. Sometimes it’s unnecessary to restore your iPad just for a smart amount of data. And a backup extractor would be of great help in this kind of situation. Check out Leawo iOS Data Recovery, it’s a data recovery program with the ability to recover 14 types of data from your iOS device, iTunes and iCloud backup. And you can also use it to extract the 14 types of data from your iTunes and iCloud backup. If you ever need a program to help you extract Contacts, Messages, Call History, WhatsApp, Calendar, Notes, Reminders, Safari Bookmarks, Camera Roll, Photo Stream, Photo Library, Message Attachments, Voice Memos and WhatsApp Attachments from your backup, Leawo iOS Data Recovery would be the best choice.